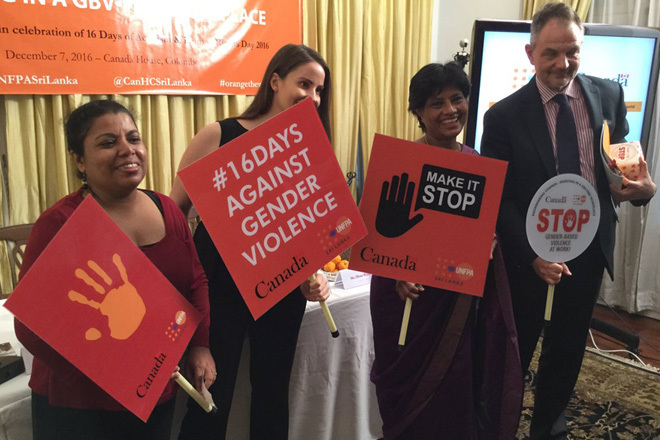 As part of the 16 Days of Activism in Sri Lanka, the Canadian High Commission and the United Nations Population Fund (UNFPA) co-hosted a panel discussion on December 7 on the importance of zero-tolerance for Gender-based Violence (GBV) within the workplace. Entitled Engendering Change: Investing in a GBV-free Workplace, the panel discussion brought together more than 60 participants including leaders in the corporate sector, government officials, human rights activists, gender specialists, academics, members of the diplomatic community, and media representatives, to consider the heavy social and economic cost of GBV and to raise awareness on how investing in a GBV-free workplace will result in social and economic benefits. Representatives from leading Sri Lankan companies also shared important efforts they had undertaken to build GBV-free corporate cultures within their workplaces. The Honourable Anoma Gamage, Deputy Minister and Sri Lankan Ambassador to the Women in Parliaments Global Forum (WIP) served as the Chief Guest. Members of the panel were: Ms. Ambika Satkunanathan, Commissioner, Human Rights Commission of Sri Lanka; Ms. Shaanaz Preena, Director, Women Go Beyond, MAS Holdings; Ms Dhara Wijetileka, Chief Executive Officer, Ceylon Chamber of Commerce; Ms. Puvaneswary Ponniah, Gender Equality and Social Inclusion Manager, World University Services of Canada (WUSC); and Ms. Jayanthi Kuru_Uthumpala-Mountaineer, Feminist and Gender Activist. With the support of WUSC-Sri Lanka, Dr. Sarah Saska, Gender and Innovation Specialist, Entrepreneur and Investor returned to Sri Lanka from Canada to participate in the panel and for a second WUSC/UNITERRA Leave for Change placement. This year marks 25 years since the start of the campaign “16 Days of Activism Against Gender-based Violence (GBV). The global campaign runs from 25 November (International Day for the Elimination of Violence Against Women) to 10 December (Human Rights Day), advocating for the elimination of all forms of GBV against women around the world. Eliminating gender-based violence in public and private spheres, and achieving gender equality, women’s empowerment, and economic and political participation are shared priorities for the Government of Canada and the UNFPA. When women and girls are given equal opportunities to succeed, we grow stronger communities and sustainable economies.